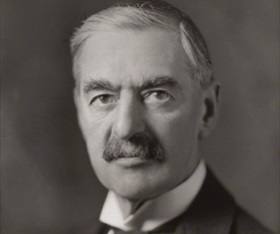 Left: Convinced that he could appeal to the practical self-interest of Euro­pean states to settle disputes among them­selves, British Prime Minis­ter Neville Cham­ber­lain (1869–1940) is best remem­bered for appeasing Hitler. After Ger­many’s uni­lat­eral annex­a­tion of the Czech state in March 1939, Cham­ber­lain reversed course and worked hard to ob­struct Hitler’s designs on Poland. During the last week of August 1939, the Brit­ish prime minis­ter believed that a firm stance by him and Édouard Dala­dier, the prime minis­ter of France, to honor their coun­try’s treaty com­mit­ments to Poland would pay divi­dends by moving Hitler to the nego­ti­a­ting table, where a solu­tion to the Polish ques­tion would then be guaranteed by an international settlement. 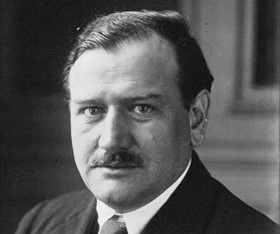 Right: French Prime Minister Édouard Dala­dier (1884–1970) had no il­lu­sions about Hitler’s ulti­mate goals. A signa­tory him­self to the ill-fated Munich Agree­ment, he told Cham­ber­lain in 1938: “Today, it is the turn of Czecho­slo­va­kia. Tomorrow, it will be the turn of Poland.” He urged their two coun­tries to stick together. 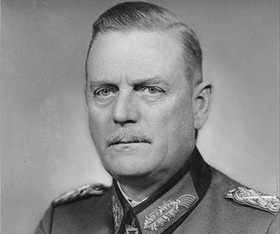 If the two allies capitu­lated again to Hitler, he pro­phe­sized they would pre­cip­i­tate the war they wished to avoid. War came anyway. Left: Chief of staff and de facto war minister under Hitler, Wil­helm Kei­tel (1882–1946) believed that the August 1939 Ger­man-Soviet Non-Aggres­sion Pact (Molotov-Ribben­trop Pact) mili­tated against the pros­pects of a war with Poland turning into a world war. Wrong on so many other counts begin­ning on Septem­ber 3, 1939, Kei­tel was tried by the vic­to­ri­ous Allies at Nurem­berg, sen­tenced to death, and hanged as a war crimi­nal on October 16, 1946. 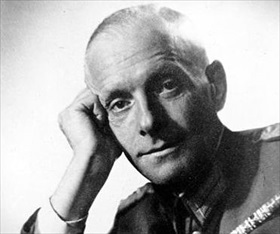 Right: A counter-intelligence officer in the Ger­man Ab­wehr (Ger­man intel­li­gence ser­vice) under Adm. Wil­helm Canaris, Hans Oster (1887–1945) was delighted to hear that Hitler had re­scinded his order to march on Poland. “The Fuehrer is done for,” he pre­dicted. “It is now merely a ques­tion of time and man­ner: how could this un­masked impos­ter be removed with the least trouble and the most ele­gance.” Both Oster and Canaris were hanged on Hitler’s orders when their con­nec­tion to the July 1944 bomb plot was discovered.